Observation is an important aspect of Montessori. Parents of enrolled students are encouraged to come observe the classroom and their student throughout the year. All prospective parents are required to observe in a classroom before they can register and enroll their child. Mixed Ages - Classrooms have a three year age span of children. This allows young children to observe, emulate, and learn from older children and the older children to build confidence in their knowledge and practice leadership skills by helping younger ones. A sense of community develops. The Guide’s Role is Unobtrusive - Children are connected to the environment and inspired by the lessons the adult gives. Their need for self direction motivates them to be become independent learners. You’ll See Materials Not Toys - Children work with the developmental materials gaining independence, self esteem, self confidence and a love for learning. The Classroom is Child-Centered - All the shelving, materials, furniture, artwork, and decorative features are child sized and at their eye level. This is their workspace and needs to be comfortable for them. Children are Quiet by Choice and Out of Respect for Others - Children are allowed to work in inner peace which is more natural to them than a noisy room they’re unable to concentrate in. There are Self Correcting Materials - Children can learn through repetition and their own errors to correct themselves instead of relying on others. This gives them self confidence and the desire to learn more. The Environment is “Prepared” - Everything has a place and purpose. The children already have a sensitivity to order. The order makes them feel secure, allows freedom of movement and positive growth. Children Work for the Joy of Working - Children are sponges and work for the pleasure the process gives them, not for the outcome. The Emphasis is on Concrete Learning - Children learn through exploring with their senses. They need a concrete piece of apparatus that allows them “hands on” experience and gradually work into the abstract. The Environment Provides a Natural Path to Self Discipline - A sense of community is built through the mixed ages and through Grace and Courtesy lessons. Limits are clearly and respectfully laid out and thus the expectations of the community tend to elevate the behavior of the children. 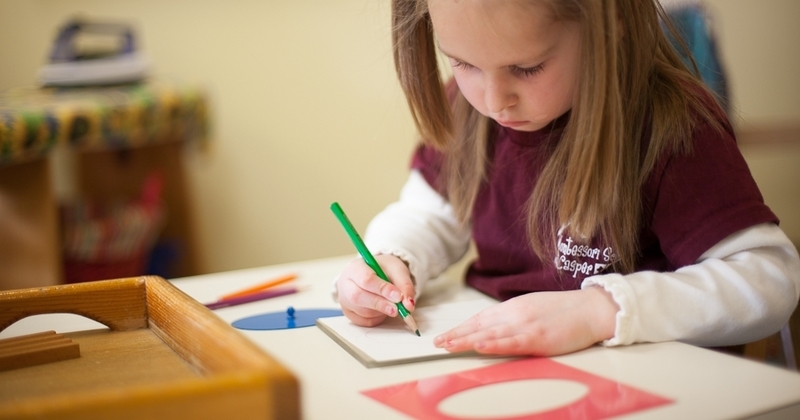 To schedule your observation, please call the Montessori School of Casper office at 307.265.0249.